In the time it takes to eat an ice cream, Thu, The Queen of Clams, and her crew pull a full kitchen and a miniature plastic dining room out of a small steel trolley and set up the greatest hến (baby clam) spot in the city. 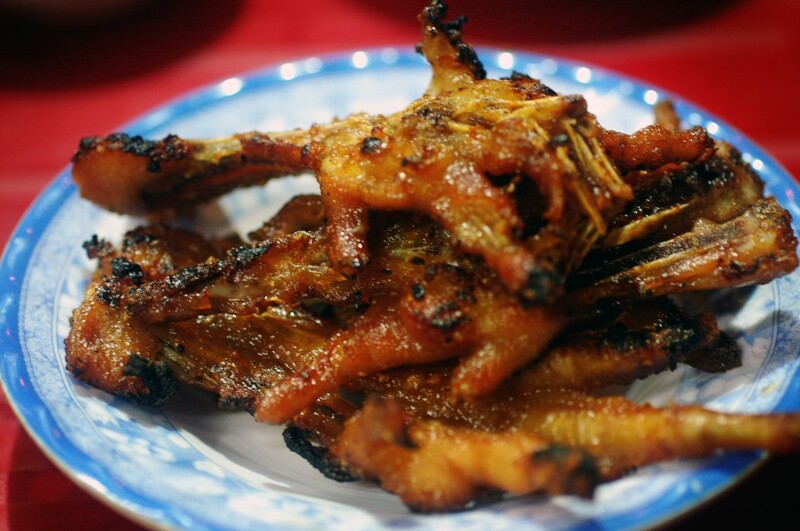 After setting up, Thu sits down behind a glass display packed with stewed fish, baby clams and chewy shrimp cakes. About six kilograms of fresh herbs hang above her two bubbling cauldrons of tart broth. For the first hour after she opens, Thu banters with her saucy sous­chef and neighbors. At times, you may catch her closing her eyes, seemingly to catch a few seconds of sleep. Things get crazy for Thu as the day wears on. By 8 p.m., the alleyway resembles a zombie film. Central transplants from all over the city tromp in and crowd around her clamoring for clams. All of her dishes sell for VND14,000 with the exception of her bánh Huế – a heaping mixed plate of shrimp and pork cakes with chả and nem chua that goes for a whopping VND20,000. You can’t really go wrong here, but if you have to eat just one thing, consider her cơm hến (baby clam rice) – a dish that’s as dazzling in its assembly as her restaurant. Thu builds the base of the dish with fistfuls of sliced banana flower, peppermint, purple lotus stem and baby lettuce. 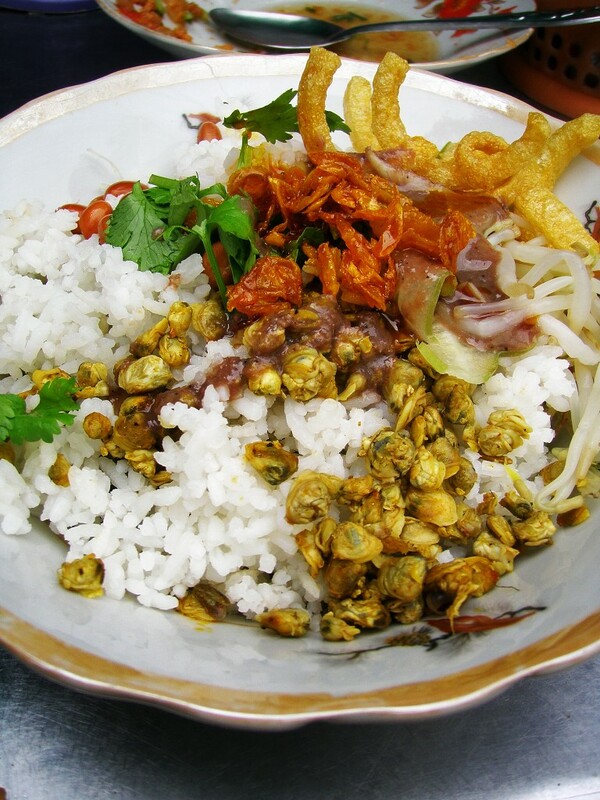 The salad base disappears under a scoop of steamed rice and buttery baby clams. The final layer is drawn from a set of open jars containing fried shallots, chili paste, fermented purple goo (mắm tôm), peanuts and pork rinds. These huge flavors all manage to keep each other in check. In the time it takes to eat an ice cream, Thu and her crew pull a full kitchen and a miniature plastic dining room out of a small steel trolley and set up the greatest hến (baby clam) spot in the city. paste, fermented purple goo (mắm tôm), peanuts and pork rinds. This entry was posted in News on October 20, 2013 by Calvin Godfrey. Every once and a while, a dish comes along in Saigon that’s so good, it eats up a whole alleyway. That’s certainly the case at my new favorite Quang Nam noodle spot, which is hidden in a sea of schoolchildren. To find the place, you’ll have to duck into the narrow alley that begins at number 12 and navigate the stuffed eaters mounting their bikes to begin a slow ride home under a web of Christmas lights. You’ll t know you’ve found the place when you smell fish in the air or catch sight of the small white sign placed at the top of the parked bikes that reads bánh canh cá lóc. No flower, no stink, no fresh basket of laundry could ever compete with the briny steam emerging from the pots, which bubble all day and flood the alley with customers around three. 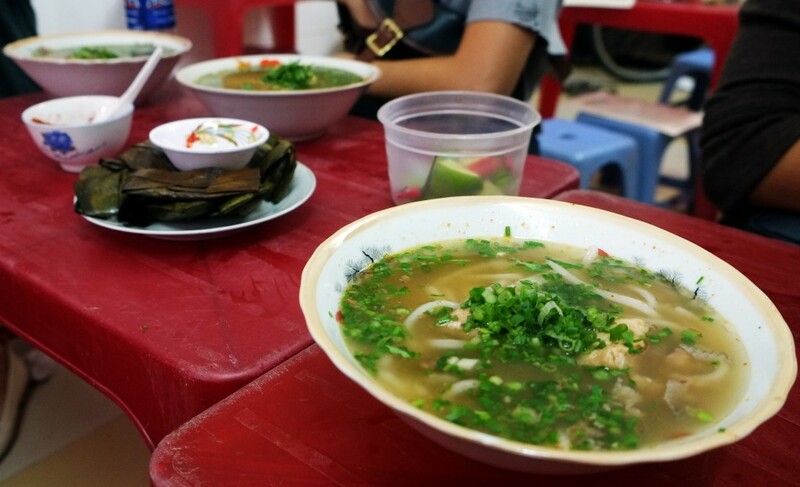 For a decade, a Quang Nam family has served the thick square noodles in a broth that smacks of the sea—a red herring, of sorts, since the fish itself thrives in swamps and puddles. The white Quang Nam rice noodles are more substantial and less chewy than the gooey transparent tapioca variety of the same name. They play nicely with the few chunks of stewed fish that give the soup (and the alley) its flavor. A spoonful of the house’s dried chili flakes and an extra bowl of chopped green onions send the whole thing into a nose­dripping, soul­tingling overdrive.. In the same way that the noodles will dominate your day (you probably won’t want to eat again) they seem to dominate the alley. Mounds of spent banana leaves (peeled from bánh lộc shrimp and tapioca dumplings) and napkins soiled by customer drool stack up like floodwater. None of the neighbors complain or even try to compete. Everyone in the alley appears to have resigned to living like planets in a solar system of this soup. One home, across the way, serves, full­time, as an open dining room. Another sells sugar cane juice to cool the chili burned, salt parched mouths of the mob. You can sit at your stool for quite a while before anyone gets the idea to take your order. So you’d better speak up. Also, it’s not a bad idea to order an extra side of fish. Just in case. I have tried and failed, for my entire life, to understand the chicken foot. Every bite left me with the same question: Why would anyone opt to eat the rubbery, reptilian sticks that prop up mankind’s meat lollipop? Mai Xuan Canh has served chicken in all forms (24/7 for 20 years) in the shadow of the central post office. 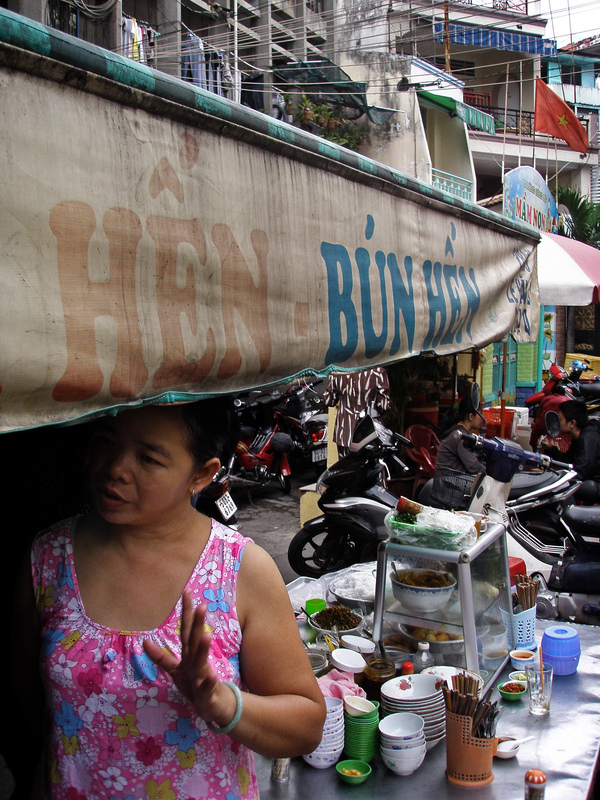 Every morning, Xuan, a sassy Hanoi­born matriarch, serves mien ga (chicken glass noodles) to a loyal customer base of northern transplants and masochists. A number of local bloggers have dubbed her place mien chui— literally “verbal abuse noodles.” Most of her ire is directed at her own staff, but I once got chui’d out for stopping in front of her business to answer a phone call. The night service is managed by her son Minh, who sits down every day at 2 p.m. with a sharp knife and a calloused hand and sets to work splitting chicken feet into perfect halves. Minh sinks the split claws into a secret mouth­tingling marinade of his own design. For the next twelve hours, the feet are grilled on the home’s rooftop barbeque. At some point in this process, the inedible claws, transform into chewy, charred meat candy that leaves the tongue and head buzzing long the after last shred of tendon has been sucked off the bone. Achieving this transformation was no easy feat. Indeed, it nearly killed Minh. He works all day (and night) to hold his piece of sidewalk. Rather than relying on frozen American imports, Minh bought his chickens (feet and all) from relatives in the Mekong Delta province of Long An, according to his older sister Hien. His dour squad of waiters was drafted from his wife’s extended family. Even the handicapped chewing gum vendor is a distant aunt. In addition to helping prepare all aspects of the day menu, Minh often stays up all night to micro­ manage every aspect of the operation. At one point in the restaurant’s history, a television screen provided diners with a closed circuit feed of a row of cooks fanning the rooftop barbeque. The screen was not meant to provide entertainment, but a method of constant surveillance. “Nowadays, he gets the feed on his laptop,” said his youngest sister, Hong. Minh rarely slept, she said. Instead, he would return home in the backseat of a car to catch a two or three hour nap before returning to the restaurant to cut cucumbers. “When he’s here, the food is the most delicious,” she said. Last year, Minh collapsed from some sort of heart trouble. “He was seconds away from being dead,” Hong said. Stress seemed the most likely the cause. The local constabulary has forced the family to push their sidewalk seating farther back and all five of Minh’s kids are off studying in America. Naturally, he didn’t rest for long. Minh’s back in the saddle: smoking, drinking vodka and keeping an all-seeing evil eye on his operation. The cucumber pickles remain well­trimmed and the plastic stools are kept warm all night long by the odd mix of prostitutes, wealthy drinkers and young lovers who cannot get enough of the fantastic feet. On a side note, Bryant Ng (of the Spice Table) was so bowled over by these feet, he took the flavor home and used it to create a chicken homage to LA legend Campanile. This entry was posted in News on October 16, 2013 by admin. 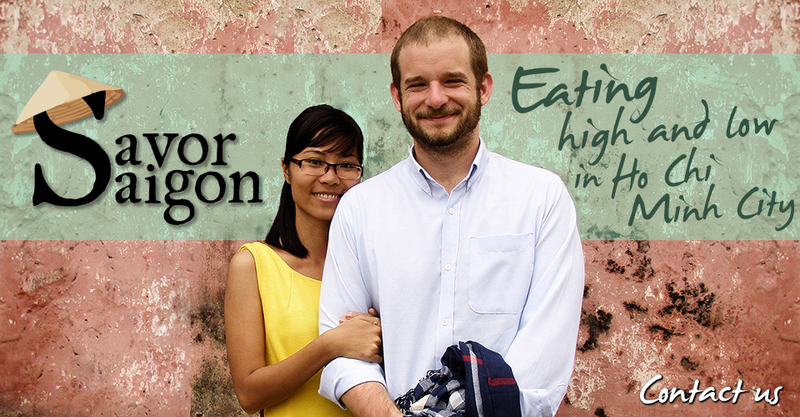 The Nguyen Dynasty gets a lot of credit when it comes to the tasty snacks served in the city of Hue. No description of the “imperial cuisine” is complete without some mention of Emperor Tự Đức who famously demanded that every meal consist of 50 dishes prepared by 50 cooks. Few note that Tự Đức insisted upon these elaborate feasts during times of famine and pestilence or that his cooks stole what they wanted from vendors in the local markets. Here in Ho Chi Minh City I’m more impressed by cooks to make one thing and do it really well. Especially those who manage to do so on a sidewalk without stealing from anyone. Uncle Phien is just such a man. He opens his Hue cuisine shop in the afternoon – usually around 3 p.m.
As soon as his stools hit the pavement, a team of shy waitresses begins dealing bite­sized snacks with all the speed of a Vegas blackjack dealer. They do bánh nậm, bánh ít and bánh lọc – all snacks made of pork and shrimp wrapped up and steamed in soft rice or cassava dough. For less than a dollar, you can eat your fill of these mothers. 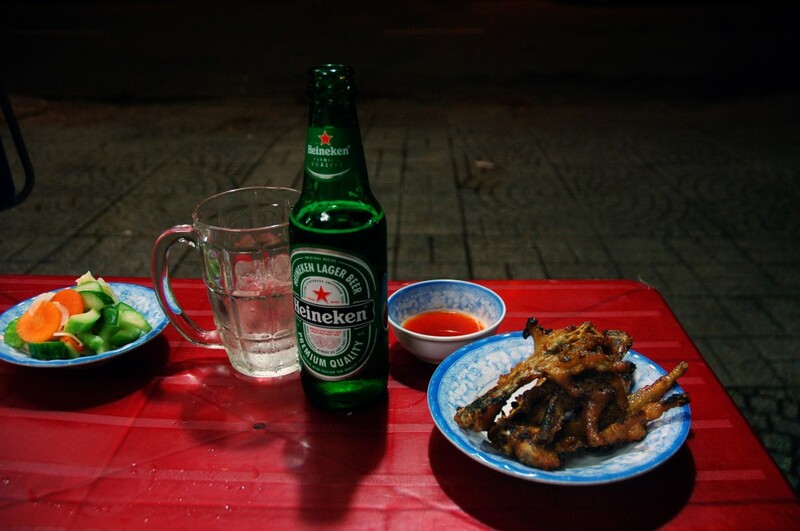 Phien’s fish sauce is good enough to drink alone; he claims to blend it with sugar and homemade shrimp stock. Drop a wad of chopped yellow­green chilies into your bowl and pour a spoonful over each cake. 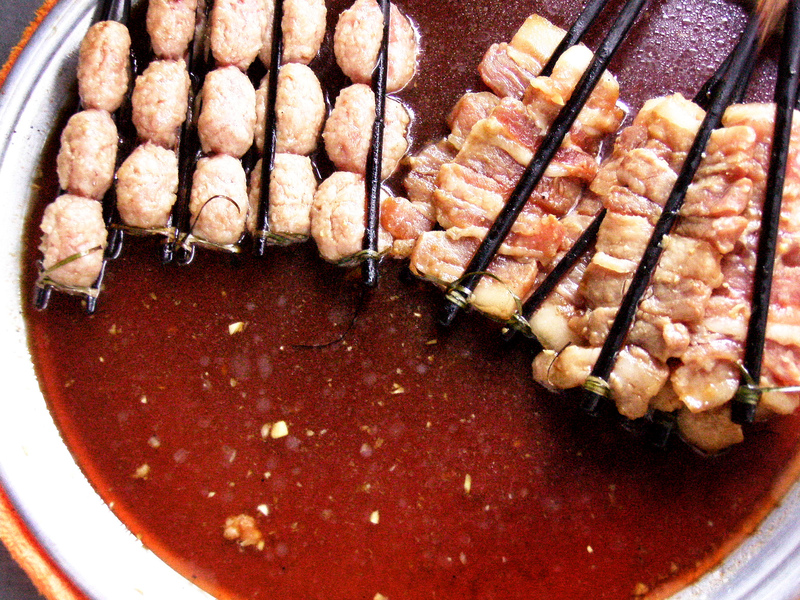 If you’re really hungry a slice of chả (a pepper­studded meat log) lends the snack some heft. 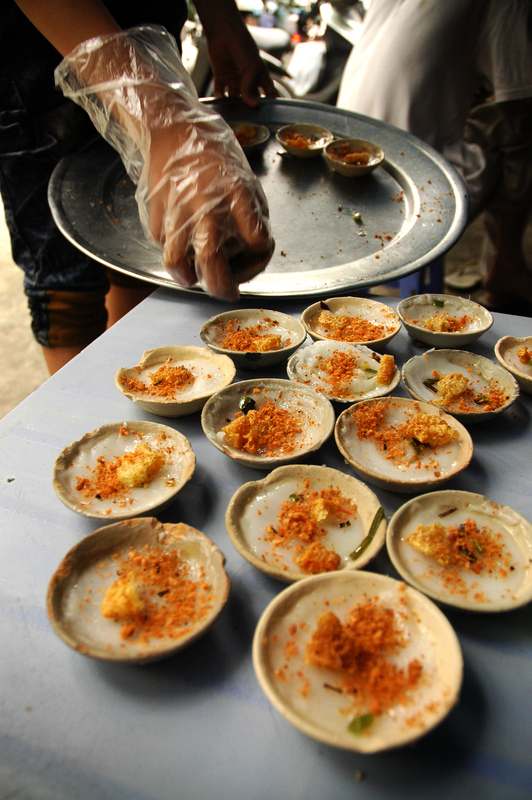 A lot of street bánh bèo are shucked from their tiny bowls in advance of your arrival. Here, you have the pleasure of carving each one out with a spoon. This entry was posted in News on September 25, 2013 by Calvin Godfrey. A legion of ladies roamed the streets with makeshift grills carved out of French biscuit boxes on their heads dealing in perfect pork. 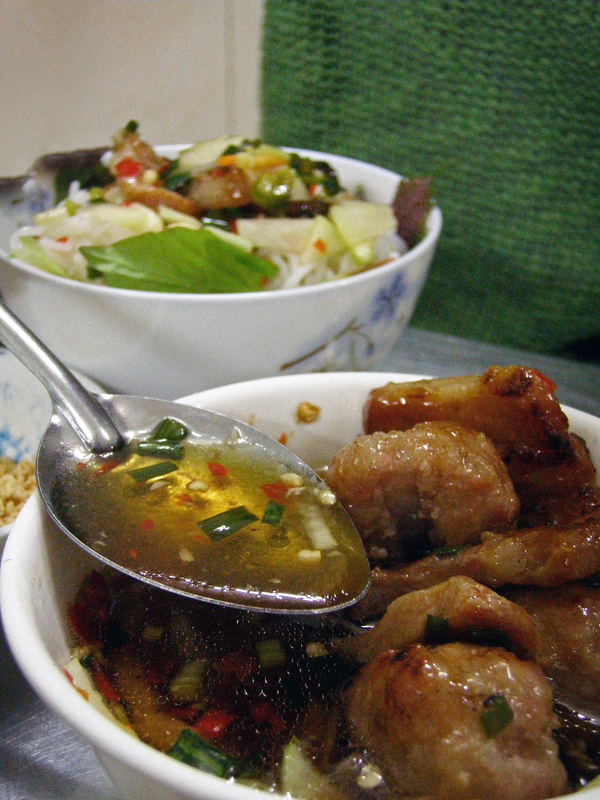 The chả, as it was known, came in tender meatballs and fatty slices of belly. The masters of the meal served it lightly charred, evenly cooked and moist. They could never be outdone at home, leading many vexed housewives to suspect they had slathered their pork in dog fat. But there was one thing everyone did know: their special blend of ﬁsh sauce and rice vinegar made the meal. Bang warned his readers that the sauce (“not too salty and with just enough vinegar”) could become addictive. Indeed, he wrote like a true junkie, particularly in describing the moment when a soft minced patty “melts into” a crunchy slice of pork belly in a single bowl of ﬁsh sauce ­ “bringing a harmonious rhythm to the palate.” Overall, he seemed optimistic about the future of grilled pork and rice noodles. He reported that market stalls had started serving the meal to crowds of diners. The shier among them headed for what he guessed was the nation’s ﬁrst bún chả restaurant—a small but already famous place on Gia Ngu. Last month, the matriarch and grill meister Do Thi Dao passed away. Her husband followed soon after. But the business has continued under their only daughter, Lan, and a handful of relatives who have come down from up North to grill up immaculate pork balls and thick belly slices between bamboo sticks and tied with a piece of dried banana leaf. Nothing is cooked until their customers arrive. When the order is given, they fan a small ﬁre and begin working the skewers like foosball rods. Most of the smoke creeps up a tin chimney but just enough gets trapped on the meat. The food arrives at the table about 15 minutes later, exceeding all of Bang’s qualiﬁcations. Each serving gets a scoop from a bucket of crisp green papaya and carrot slices soaked in vinegar and a ladle of Nước Mắm Phan Thiệt. The balance achieved here would blow Bang’s mind. Beyond the meat, Bún Chả Hà Nội gets everything else right. It’s spotless. The bright dining area could be mistaken for an operating room saved for the display of Snoopy memorabilia that occupies the far wall. The herbs—baby butter lettuce, perilla, ﬁsh mint, cilantro, basil— always come out equally spotless. 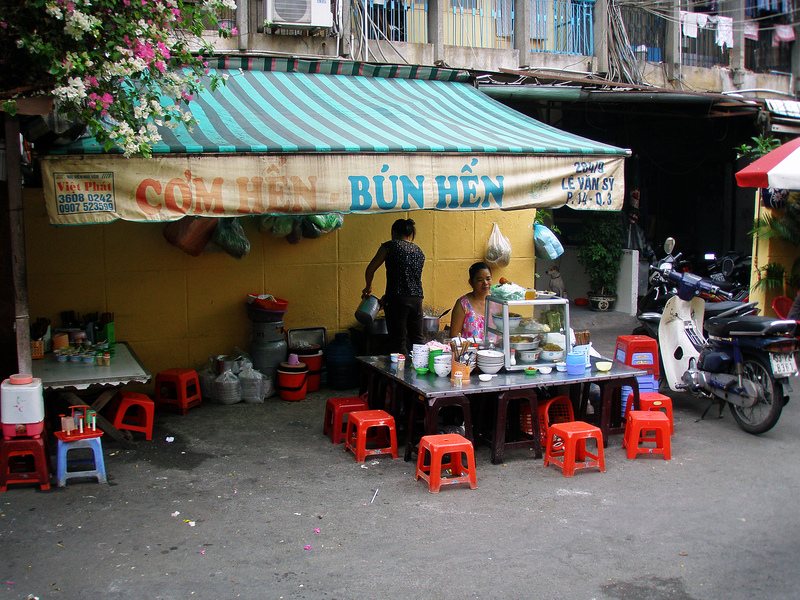 Each serving of bún chả comes in at a mere VND50,000. The all-pork spring rolls (enough for two people) go for VND20,000. This entry was posted in News on September 7, 2013 by Calvin Godfrey. Pick up the latest copy of Lucky Peach and read Nhan and Calvin’s 6-page spread about the lady butchers of Binh Tay Market! Then hire Nhan and Calvin to take you out to meet them! This entry was posted in News, Uncategorized on September 7, 2013 by Calvin Godfrey. 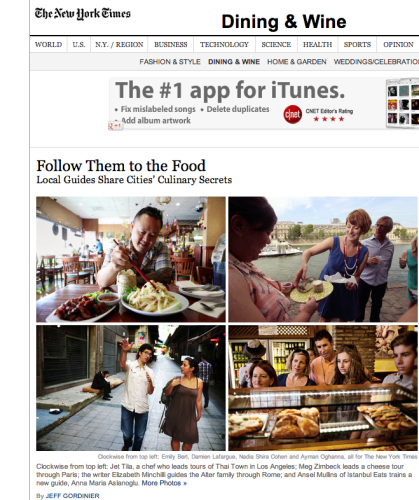 This article on “Food Sherpas” inspired us to go mainstream with a website! We love that what we do is becoming popular!